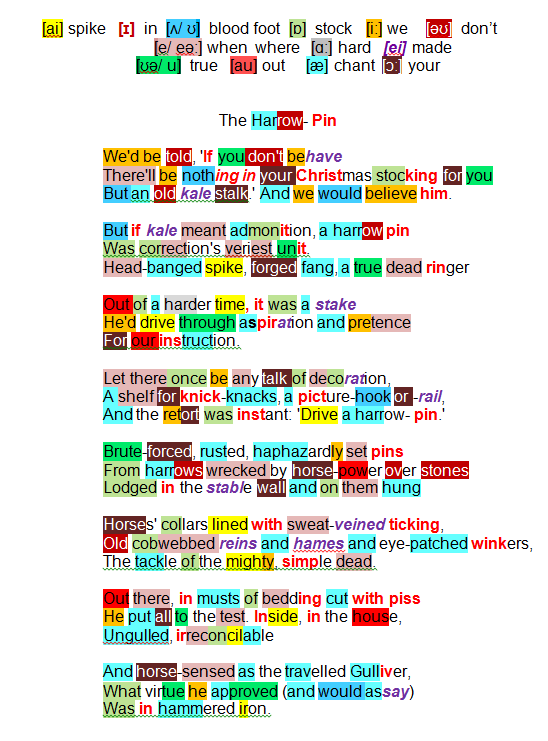 In this first of three ‘workshop’ poems Heaney paints the character portrait of local blacksmith, Barney Devlin of ‘Midnight Anvil’, recalling his uncompromising finger-wagging insistence on high moral standards amongst the rural children who frequented his workshop … and we believed him. Barney is issuing the ‘old’ warning that Santa Claus only visits good children – the naughty ones will get only an inedible vegetable (old kale stick) – his short-lived spoken reprimand (admonition) compares with the enduring solidity of the harrow-pin he is producing, a symbol of ‘real’ chastisement if ever there was one: correction’s veriest unit.. The pin’s qualities are listed: blacksmith-produced, a head-banged spike with the sharpness of a tooth (forged fang); a pin resembling a thousand others produced to the sound of his hammer (a true dead ringer) somehow recalling leaner times (out of a harder time). The blacksmith hands out a lesson aimed at cutting youngsters down to size (a stake he’d drive through aspiration and pretence) and an educational tool for our instruction. The harrow-pin is the universal fixing: at home for decoration whether shelf for knick-knacks or picture-hook or rail … roughly fashioned (brute-forced, rusted, haphazardly set), reclaimed from agricultural wreckage (harrows wrecked by horse-power over stones) acting as a hook on which to hang horse-tackle (collars… reins … hames… winkers) once sported by humble deceased farm horses of the past: the mighty, simple dead. Whether in his workshop, amidst the stench of the animals that came there bedding cut with piss he took nothing for granted (he put all to the test). At home with his family he is no one’s fool (ungulled), set in his opinions (irreconcilable), experienced, and astute: horse-sensed as the travelled Gulliver. Barney Devlin’s acid test of quality (virtue) is founded on his hammered iron. Heaney continues to ring the assonant changes in (7) using [ʌ] musts/ cut/ put/ ungulled; [ɪ] resounds: piss/ Inside, in/ irreconcilable; the [e] of bedding/ test/ irreconcilable carries into (8) –sensed alongside [ʌ] Gulliver and the new [u]/ [uː] virtue/ approved.